An ideal destination rich in a diversity of flora and fauna awaits intrepid explorers with a fascination of all things botanical, geological and zoological. For those who want to feel closer to nature, here are our top picks. The River Nore flows right through County Kilkenny and offers a wonderful perspective of the countryside for those interested in communing with the natural world. There are a number of defined walking trails that follow the river such as The Nore Linear Park through the city and of course many countryside trails to suit all levels. It is so easy to make it by foot from Kilkenny to Bennettsbridge, or meander through the pastoral lands and woodland from Thomastown to Inistioge. 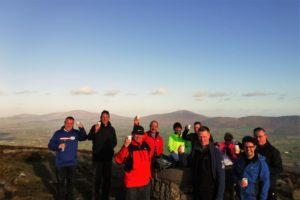 Discover some of the natural beauty and flora and fauna with a guided walk of Brandon Hill or embark on an invigorating and interesting experience on one of the themed trails, Made in Kilkenny Craft Trail or the taste of Kilkenny Food Trail. There is even a walking festival! The Dunmore Caves is a must see! By car, it is just minutes away from the City. One of Kilkenny’s most historic sites, the caves are made up of a series of beautiful chambers that have formed over millions of years. For lovers of nature and history this is a unique experience to feel close to the past and embrace the wonders of mother nature. The first mention of these caves dates back to the 9th Century Irish Triads and archaeologists have found evidence that confirm Viking activity within the cave as far back as 928 AD. Along with the exhibition centre, there is an informative tour of the cave which last for approximately one hour. Make sure to arrive approximately one hour before the caves close to take part in a tour and always check opening times in advance as they vary from season to season. This beautiful 80 woodland acre park with gorgeous woodlands is only 20 minutes from Kilkenny City by car and is on the same route from the Dunmore Caves. Visitors can casually wander through the woodlands and for the more adventurous souls, there are plenty of outdoor activities to choose from such as a tree-top walk, climbing walls, a zipline and octagon, canoeing and archery to name just a few. Grab lunch while visiting the park in the Jarrow Café and browse through the craft yard. The zipline in Castlecomer Discovery Park isn't just any kind of zip line! It is in fact Ireland's longest over water zipline.